Prepare to be left speechless by the beauty of the Great Sand Dunes National Park. Bordering Wyoming, Nebraska, Kansas, Oklahoma, New Mexico and Utah (it also touches Arizona at the famous Four Corners), Colorado is a Middle American state with immense character and an exhilarating history, with a rich Gold Rush heritage dating back to the 1800s and strong lineage to the Old Wild West. However, where Colorado truly stands out from the crowd is within its picture-perfect landscape. Bountiful in mountains, forests, canyons, river plains and deserts, it’s an adventurer’s dream destination. Shining a big spotlight on Colorado, we made it our mission to discover what makes America’s eighth-largest state well worth a visit. Hike the peaks of the Rocky Mountains National Park. …in one of Colorado’s four national parks or 42 state parks or eight National Monuments. The National Parks are like giant playgrounds for visitors, especially in the summer. 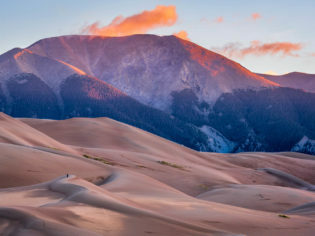 Rocky Mountain National Park boasts peaks that overlook vast plains, while the ancient dwellings of Mesa Verde National Park and the grand mountains of sand in the Sahara-esque Great Sand Dunes National Park will leave you speechless. Explore Mesa Verde National Park’s ancient dwellings. A shout goes out as well to the seemingly never-ending rock walls of Black Canyon of the Gunnison National Park – truly a must-see. The National Monuments are also worth working into your itinerary, especially the newest of the eight, Browns Canyon National Monument, which was awarded its prestigious spot by President Barack Obama in 2015. The stunning 8735-hectare spot provides fresh water and habitat for wildlife like bobcats, bighorn sheep and black bears, and is truly breathtaking to clap eyes on. No one photograph can capture the sheer scale of Gunnison National Park’s Black Canyon. Colorado’s 10 historic and scenic rail routes will not only take you on a tour through history; they’re as entertaining as they are informative. For a thrill, hop aboard the Murder Mystery Train operated by Royal Gorge Route Railroad and find out who dunnit over a theatrical dinner. Also for the history buffs out there, travel on the historical Durango & Silverton Narrow Gauge Railroad train for some of the most spectacular scenery in Colorado. The rail road was originally constructed for miners to transport silver and gold ore around the San Juan Mountains. These days you can enjoy the views from the steam locomotive without any of the hard labor. With 58 peaks in Colorado reaching well over 4000 metres (14,000ft) above sea level, these ‘fourteeners’ are a prominent natural feature of the state. The perfect spots to position yourself to view Colorado’s famous wildlife, the state boasts more ‘fourteeners’ than any other in the union. So the question is, how many can you do? While it has mountains and picturesque landscapes aplenty, Colorado also boasts bodies of water perfect for whitewater rafting or casting a lazy line, for those hoping to reel in the catch of the day. Seven major rivers have their headwaters in Colorado, providing a nature lover’s playground, no matter what your speed. Dating back to the Old West era, Denver is a cosmopolitan, charming city that still boasts ties to its storied origin, giving guests a taste of the old and new in one gulp. To experience the best of Colorado’s outdoor capital city like a local, there are three things any visitor must tick off their list: western art, shopping and craft beer. Packed with museums like the Denver Art Museum and the Red Rocks Amphitheatre, which hosts celebrated music acts, there’s no better way to wrap up a Denver day than with a pit stop at the Strange Craft Beer Company, or Freshcraft for a tipple of the best this town has to offer. Visit the town of Victor and get a taste of what the Old West was really like during the Gold Rush of the 1800s. With 1500 ghost towns scattered across it, visitors can easily find traces of the Old West as they take a walk down deserted streets and peek through dusty windows. Towns like Carson, Victor and St Elmo give an insight into life during the Colorado Gold Rush of the 1800s. Alternatively, become a cowboy (or girl) for a day by jumping in the saddle at a dude ranch to take the experience one (exhilarating) step further. Travelling 26 scenic and historic byways throughout Colorado on horseback is an increasingly popular way to explore the state’s four National Parks. With 28 world class ski resorts, Colorado could well offer up the epic ski trail you’ve always wanted to hurtle down. In fact, Colorado’s slopes have been named America’s best and claim to be home to the most thrilling trails you’ll find country-wide. Challenge accepted! Take a soothing dip in Glenwood Canyon’s hot spring. One of the 30 mineral-rich baths in Colorado. The breathtaking natural features of Colorado don’t stop at mesmerising mountain peaks and rivers that stretch on as far as the eye can see. Oh no. One of the state’s most popular natural offerings are its hot springs. The coolest part about accessing these naturally heated pools, is that you’re never far from one. With 30 soothing mineral-rich baths scattered across the state, you’re just as likely to stumble across one in a luxurious resort as you are at a hike-in hideaway. Aspen in summer – is it even better than in winter?